The panel brought together a growing coalition of academics, non-profits and political leaders who are committed to advancing the Austrian perspective in our monetary policy discourse. The panel roundly criticized the precedents set in the Wall Street bailout, the implicit “too big to fail” clause in Dodd-Frank and the monetization of our debt through the Fed’s second round of quantitative easing. The devaluation of our currency through a loose monetary policy, as multiple speakers noted, is the single most insidious act a government can perpetuate against its people. 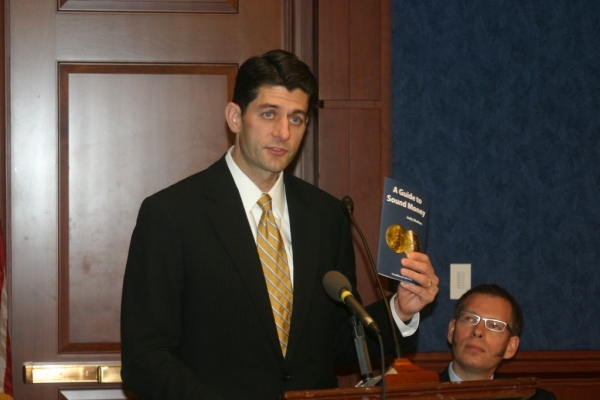 Each speaker lauded Dr. Shelton’s recently released A Guide To Sound Money, which Congressman Ryan even called “the best 23 pages on money I’ve read in a long, long time.” Lips also expressed gratitude that FreedomWorks was willing to distribute copies of The Guide to our vast network of grassroots activists around the country. Over 100,000 copies of The Guide have already been printed and will be distributed by FreedomWorks to our activists around the country. Copies of The Guide can also be accessed in pdf form here. Dr. Shelton has been a great partner and a leading voice in the debate against the present policies of the Federal Reserve. She will be joining us at FreedomWorks as a Senior Fellow and the Director of Monetary Policy. The addition of Dr. Shelton comes just one month after we welcomed Dean Clancy, formerly a Senior Health Policy Advisor at the Joint Economic Committee, as our new Vice-President of Health Care Policy. He has been tasked with our strategy for a repeal and replace of Obamacare in the 112th Congress. The involvement of Mr. Clancy and Dr. Shelton at FreedomWorks will dramatically increase our capacity to advance policies and legislation that support our Freedom Agenda. Watch the full video at CSPAN here.